A neutral running shoe with firm cushioning and near perfect straight line stability. Loaded with premium materials to boot. Much is to be said about an athletic footwear company which has, as far as we remember, focused only on making running shoes, inspite the allure of diversifying into different categories. And not all running shoes; only products which (for the most part) cost upwards of $90, allowing Brooks to build in a minimum threshold level of quality and technology. As shoe reviewers, we know what happens when the shoe starts getting more affordable (read $50-65); the materials used shave off specs quicker than a three-headed Phillips rechargeable. Certainly, there are exceptions to the rule; some lower priced shoes are a gem, and in the same vein, some wiffy-puffy running shoe costs north of $120 – making more profit margin than an iPhone 5. But these are glitches in the grid, and the general thumb rule is that, the more Benjamins you fork out, higher are the chances of you getting a higher spec’ed running shoe. We are reviewing the Brooks Ghost 4 today, which means we are very late to party; late to the point when everyone else has gone home. The new Brooks Ghost 5 is out in the market, alive and kicking, while the outgoing Ghost 4 shows up in the ‘close-out and discounts’ page or store shelf, depending on where you saw it. We could have jumped straight to reviewing the Ghost 5, but no. We are reviewing the Ghost 4 for the same reason we did the Asics Kayano 17 – to create a reference point for our upcoming Ghost 5 review. We won’t do that with all the shoes, but we’ll do it for the Ghost 4 and the Brooks Glycerin 9. 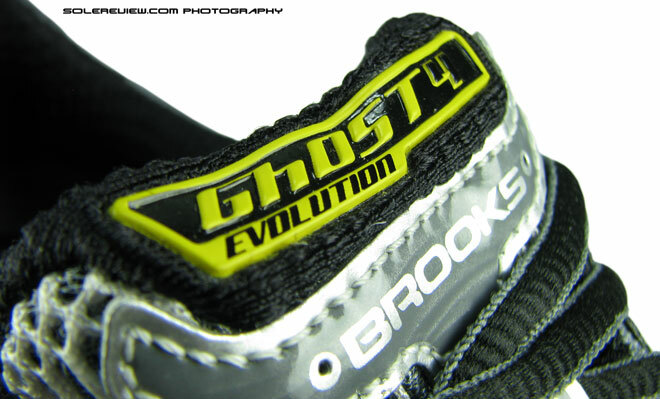 The Brooks Ghost made its debut in 2008, as seen as a replacement for the Brooks Burn, which some of you may remember, was designed for neutral runners and underpronators. The Ghost 4 has the same purpose – that of a neutral running shoe focused on runners with ideal biomechanics, while also targeting underpronators. Right from the box, the Brooks Ghost 4 feels premium and well made, with an superbly executed upper making it worthy of the $100 pricetag. Slip into them, the shoe is exactly what it advertises itself to be – neutral. The interiors of the upper, while being smooth on the inside, exudes no unnecessary plushness. Walk around in the shoe, and you feel the heel slightly compress, but not too much. Collar grips well, but leaves enough room to stick a finger or two into the gap between the side of the foot and the padded textile. But as a package, the Brooks Ghost 4 is incredibly well put together, with near zero compromises on the quality levels of the materials used. We love photographing shoes where we can capture detail and texture, and we’d say that shooting the Ghost 4 was a lot of fun. Some close-up shots of the areas which impressed us, and a brief description to go with them. This is the spacer mesh used in the Ghost 4. In this super zoom shot, the two layer construction is clearly visible, with connecting fibres in between. At Solereview, we love these high quality spacer meshes since they are comfortable (they have good compression), lightweight, and breathes very well. Since these are expensive fabrics, only premium running shoes use them. This is a unique feature. 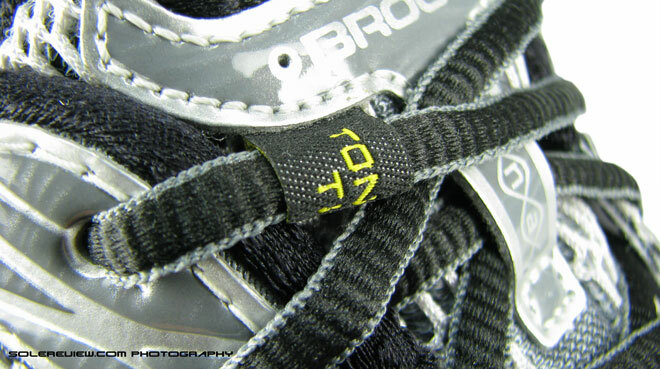 A mini-loop which, in addition to the center loop, keeps the tongue from moving by going through the top row of lacing. 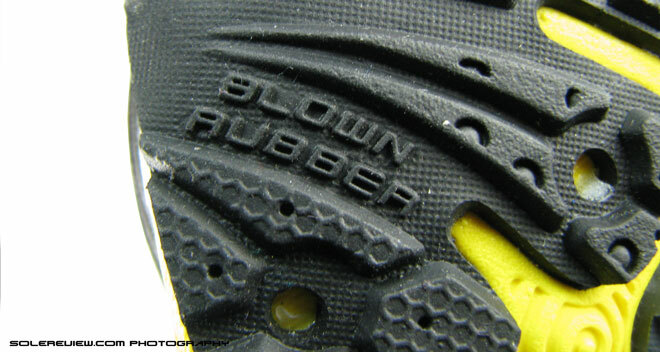 Haven’t seen or noticed this in any of the shoes we’ve reviewed. The laces itself are a letdown though. Instead of being soft to the touch and stretchy, the laces in the Ghost 4 are stiff and feels snicked out of a shoe half the price. 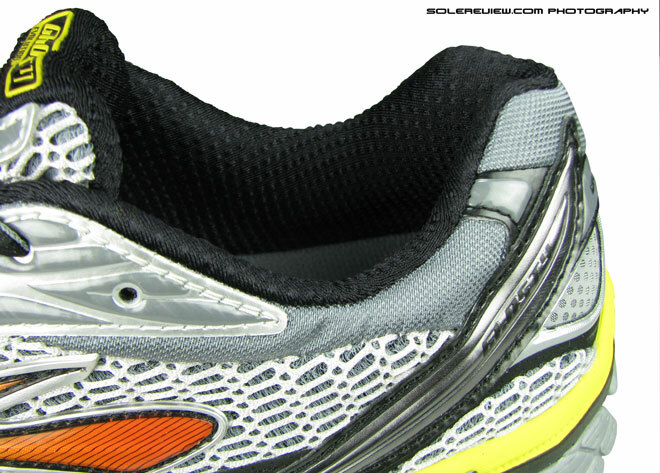 Run your fingers through the Brooks Glycerin 9 or 10 laces, and you’ll know what we mean. The attention to detail in many areas is worth mentioning. Take the reflective bits in the toe and heel for example. Instead of slipping in a piece of reflective underlay, Brooks has applied a layer of reflective material over a faux metal mesh. The heel area execution also has an additional boundary of silver colored welds over, which brings out the detail emphatically. Wait. There’s more. 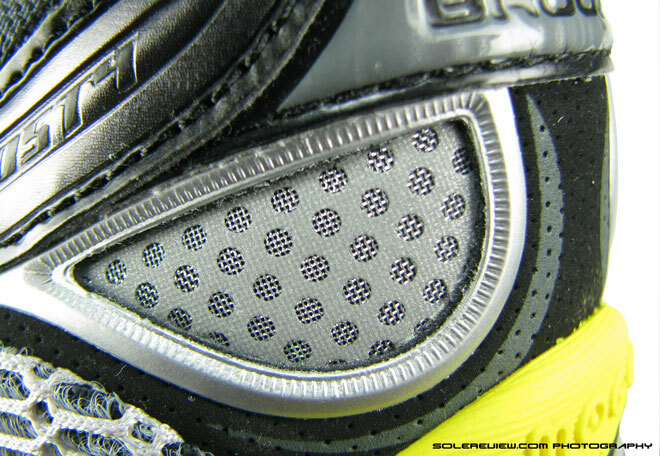 The entire area of the synthetic leather component which forms the eyestay is both printed and embossed. Functionally, it has little value, but from an aesthetics perspective, it brings an element of depth to the overall design. Collar area is single fabric construction, with a ribbed texture and soft to the touch. The same fabric is used in the tongue too. 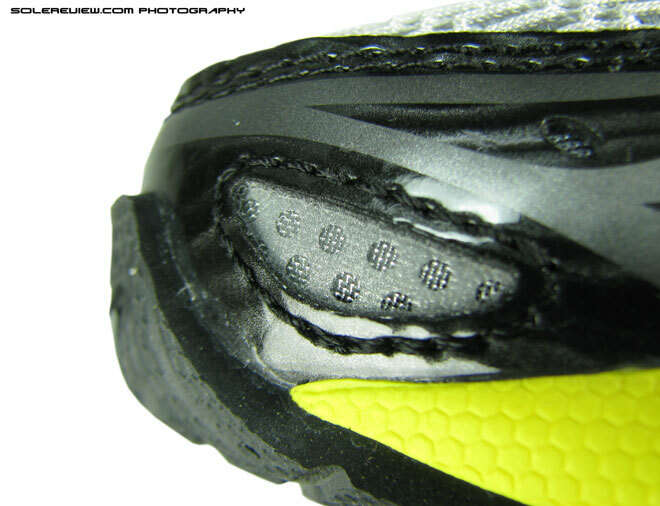 The sole unit uses a combination of multi-density foam midsole, (which Brooks calls the ‘Mogo’), carbon rubber in the heel and blown rubber in the forefoot. 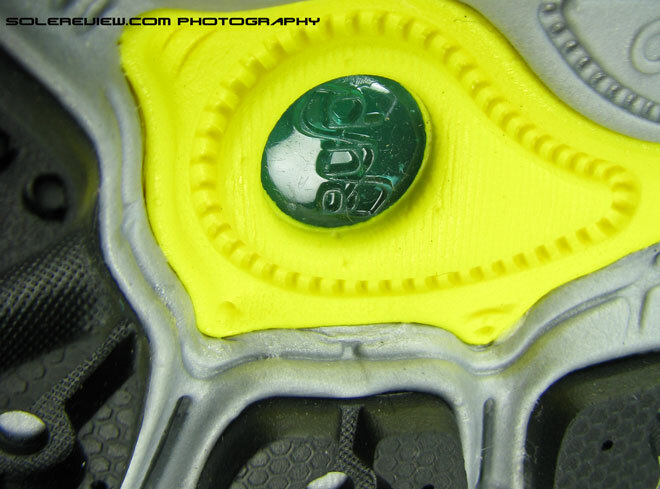 Inside the rearfoot and forefoot midsole cavities are encapsulated ‘DNA’ pods. 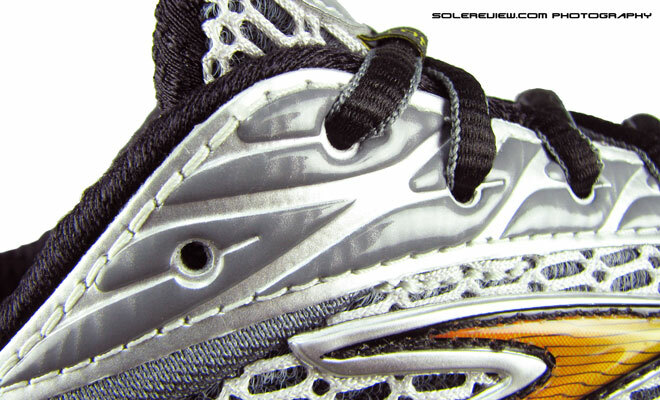 Brooks DNA cushioning units contain a fluid, which in Brooks’ tech sheet, is classified as ‘Non-newtonian’. In plain English, the thickness of Newtonian liquids, say like engine oil, reacts only to temperature. So if you heat the oil up, it becomes free flowing since the thickness decreases. However, the thickness of non-Newtonian fluids react to both temperature and pressure. So the liquid which goes inside the Brooks ‘DNA’ pods reacts differently to impact pressure (which is a combination of body weight, pace and gait pattern) which makes the shoe more cushioned at slower pace, while faster footstrikes would result in the cushioning becoming harder. During our test runs, the Ghost 4 performed incredibly well when it came to combining cushioning and stability. At slow-mo speeds, the cushioning sensation of the Brooks DNA units borders on spongy; and as the speed picks up, the cushioning gets firmer, allowing for improved stability and quicker transitions. 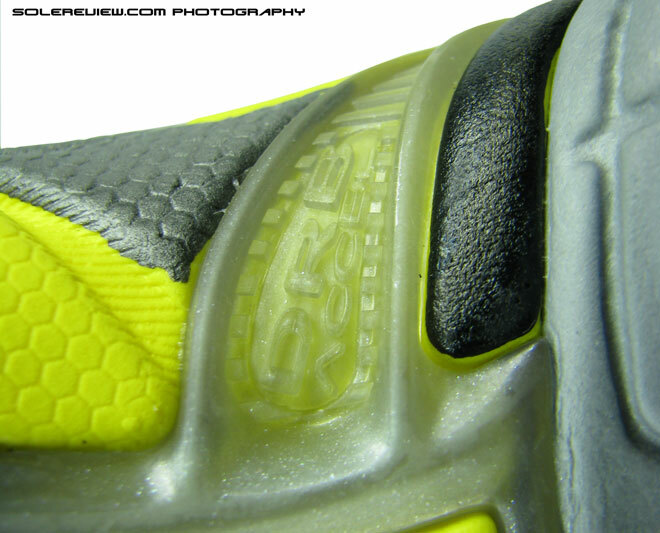 The upper keeps the foot in place, no near zero heel slip and good midfoot wrap. That said, there were a few areas of improvements which the Ghost 4 could do with, and we hope that has been addressed in the latest Ghost 5. The first is that the forefoot area feels a bit hemmed in, and that is due to the bands of synthetic leather pieces which go around the side of the toe box. They run diagonally from the base of the big toe, heading downwards towards the tip of the toe. The stitching also takes away the inherent flexiblity of the mesh; we wish that the positioning of those overlays were higher (like in the Glycerin 9) and were made of a different material. The second gap is that the arch area is not adequately supported; a little upwards flare in the insole might have taken care of that. We’ll test the Ghost 5 soon and let you know if these areas see improvement. 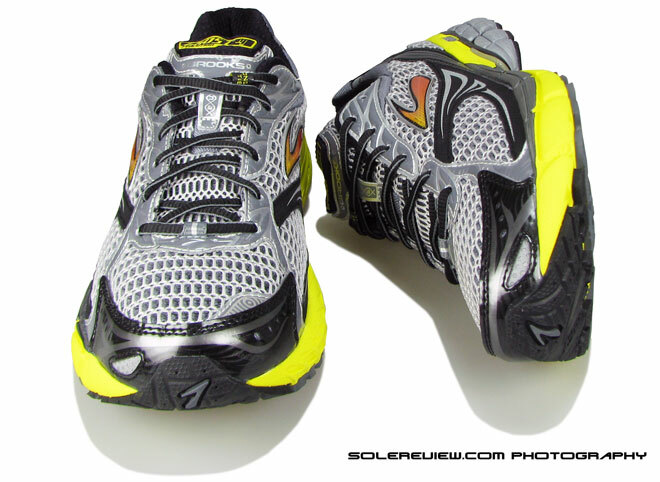 But if you look over the follies, the Ghost 4 is a great running shoe and neutral in its true sense. So if you’re looking for a cushioned yet stable ride, the Ghost 4 (now 5) is your answer.